A cancellation can be done 14 days before arrival without penalty. A deposit of 30% of the group reservation is required 14 days before arrival, if the group reservation is cancelled beyond this period, the deposit will not be refunded. A full rooming list must be sent to the hotel 7 days before arrival and the outstanding amount of the reservation must be paid 3 days before arrival. 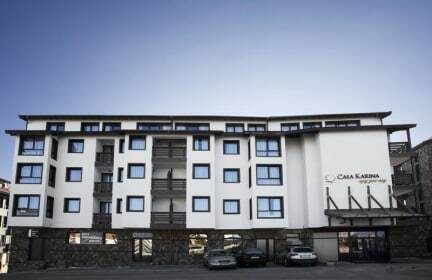 The Casa Karina hotel is situated at the foot of the Pirin Mountain, in one of the most beautiful and modern Bulgarian ski resorts – Bansko. For the comfort of it’s guests the hotel stays only 100 meters from the home station of the gondola and 20 minutes walk from the picturesque center of the city of Bansko. The cozy 3 stars hotel is open all year and allows you to enjoy a relaxing and unforgettable vacation during all seasons of the year. The hotel consists of two buildings with 267 total numbers of beds – one of the buildings has comfortable and cozy apartments and the other part has luxury double rooms. For the comfort of the guests the two parts of the hotel are band together with a warm connection between them. There is the spacious Reception which serving the guests of the both parts of the hotel. The buildings with the apartments has 14 studios, 28 one bedroom apartments and 22 two bedroom apartments which are fully equipped and furnished with all needed for a family vacation. Almost all of the apartments have baths and kitchen box. Some of them have a beautiful view to Pirin and Rila Mountain and others have a view to the city. The hotel part of Casa Karina consists of 54 luxury furnished double rooms situated at 4 floors. There are French type beds in every room, furnished with port mantua, wardrobe, chair dresser and mirror, radiators, mini bar, TV and carpeting. Most of the rooms have a balcony with a mountain or city view. For the little guests, the hotel has a funny kid club, where children can play while their parents enjoy their vacation. For seminars, conferences, trainings and other events hotel Casa Karina has a modern Conference hall with 100-120 seats. 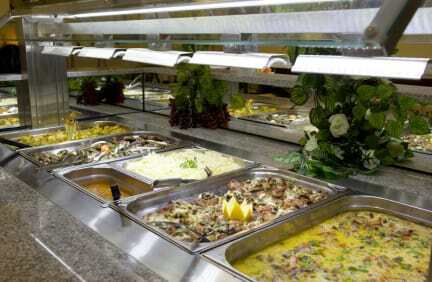 The hotel has a luxury restaurant with 230 seats with a summer garden and BBQ and a lobby bar with 20 seats. The hotel has a heated indoor swimming pool with 28-29C degrees of the water, sauna, steam bath, Turkish bath, relax zone, fitness and solarium. There is a wi-fi in all rooms, apartments, Conference hall, lobby bar, restaurant and common areas. The hotel offers ski room for own equipment and a baggage room. The Casa Karina hotel has billiards, electronic games and table tennis. Our team is always ready to help and advise the guests how they could enjoy their vacation better. We organize excursions, picnic, walks to the incredible historical and cultural landmarks in the city of Bansko and around it, hiring of ski teacher and ski equipment, horse riding, rafting, driving ATV and all that can make you feel relax and have fun. The team of Casa Karina hotel with its professionalism, smiles and care will make everything possible for it’s guests to experience a wonderful vacation. Internet wi-fi: 3.00 BGN. for 24 hours, 5.00 BGN for 2 days and 12.00 BGN for 7 days. Underground garage with limited places:: 6.00 BGN for 24 hours.